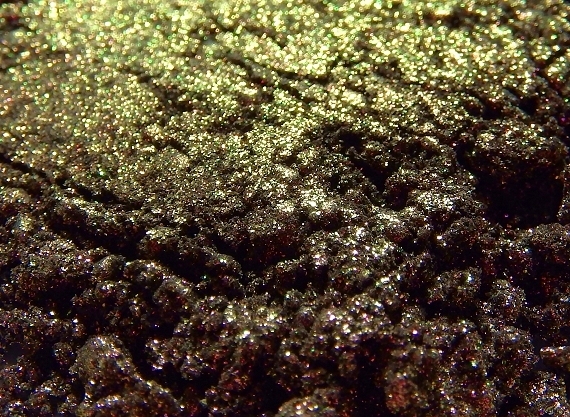 Pink-bronze sparkle on black turns gold to green. A very striking and obvious change. Similar to our Steampunk but with sparkle instead of shimmer. Swatch applied over regular primer. Note: As with all our Arcanes/Exquisites, you won't be able to see the color change as dramatically while wearing because your eyes are moving with the rest of your face of course. Initial color noted is from about an arm's length away, then as it appears closer to, or angled toward, an indoor light source. Sunlight can wash out the colors and effect.